Radial Calendar is a visualization model developed to analyse the Portuguese’s consumption data. The model is intended to assist the analysts within a Portuguese Retail Company, SONAE, in the identification of periodic patterns and deviations from the normal consumption values. Our main contributions are: (i) the representation and characterisation of the Portuguese’s consumption behaviour over time; (ii) a radial visualisation to identify consumption patterns and their deviations; and (iii) a user case study to compare this visualisation model to a regular calendar layout. Our radial calendar aims at assisting the SONAE’s analysts to search for information about the normal sales values and how they change over time, the impact of a certain sales promotion, and the most relevant department in the business. The SONAE’s analysts require an overview of the data which can be rapidly learned and easily passed within the team. Thus, the visualisation must be compact and simple, representing in a single image the whole time span, showing details about each specific day, and providing an effective and efficient qualitative overview of the Portuguese’s consumption. Additionally, the radial model aims to emphasise weekly and seasonal behaviours and detect patterns over time. The data used for this project consists of the consumption values in 729 Portuguese supermarkets and hypermarkets of the SONAE’s chains. When shopping in these retail stores, the customers tend to use their client cards to accumulate discounts and other benefits, enabling the association between customer and purchase. We analysed all the transactions made in these stores from May 2012 to April 2014. Each transaction corresponds to one product bought and has attributes such as price, date, and time of purchase. We aggregated all purchases by BizUnit or Department, and by day, and calculated the normal consumption value and its deviations. Structure of the radial calendar, and respective labels positioning: month, in the inner part of the smallest circle for each wedge; day of the week, in the outer part of the biggest circle; and the number of the week, in the first wedge in the upper part of each circle. A yellowish zigzagging line will be positioned on the calendar to mark special events. 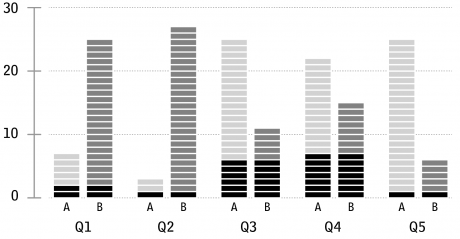 Distribution of answers to the questionnaire (each rectangle represents one answer). The lighter grey (columns A) represents the regular calendar, and the darker grey (columns B) represents the radial one. Black is used to indicate when a participant answered both models in a certain question. 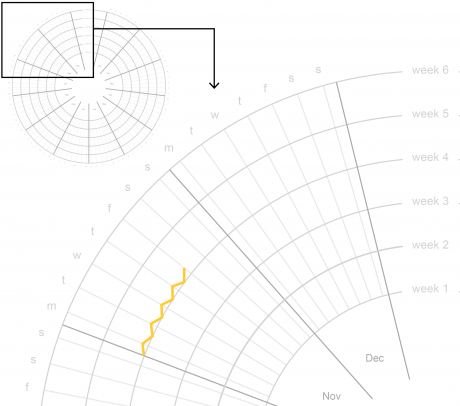 We conducted a user study to compare our radial calendar to a regular calendar layout. The objective of this study is to explore the intuitiveness and effectiveness of the radial layout in the representation of consumption data. For this study, 30 participants tested the two visualisation models in relation to performance (efficiency and accuracy) and visualisation quality (subjective evaluation of clearness, intuitiveness and general attitude toward a visualisation). As one can perceive in Fig. 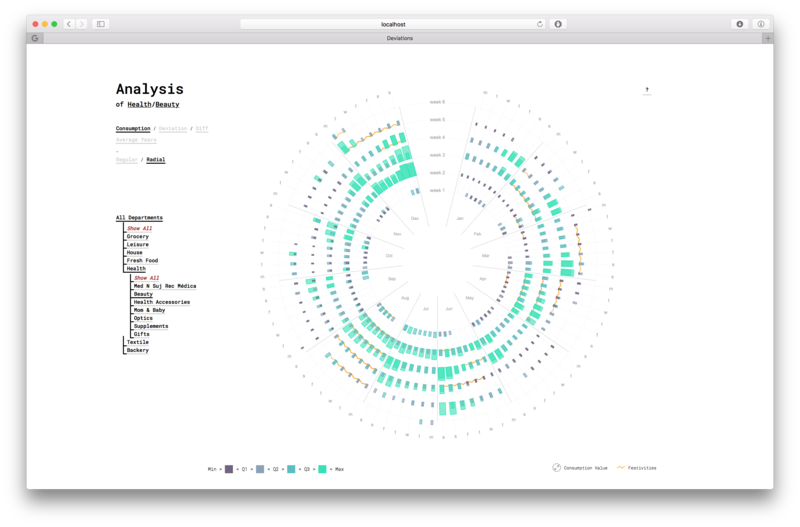 3, the majority of participants found the radial visualisation model more aesthetically pleasing [Q1] and it was the model which arouse more curiosity to explore the data [Q2]. The fact that the regular calendar was assigned to the most intuitive [Q5], is related to the fact that this layout is more familiar, as we are accustomed to interacting with this type of calendars in a daily basis. This fact also explains the tendency to chose the regular calendar as the most useful and easier to learn [Q3][Q4]. However, there was a higher number of participants which chose both visualisations in [Q3][Q4], revealing their uncertainty from which to choose. With these results, we can conclude that the regular model is more intuitive at first, but as the user learn to navigate and read the radial, this can be a better choice to represent this type of data.